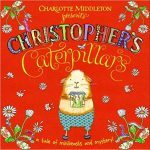 Join Charlotte Middleton and her friends Christopher Nibble and Posie at Coleford Library in this free session on Monday 3 July. Christopher and Posie have found six hairy caterpillars munching on their prize dandelion leaves. They decide to keep them as pets and look after them very carefully…but one day they disappear! Christopher and Posie become the detectives of Dandeville town, and with the help of Italian café owner, Mr Rosetti, they solve the minibeast mystery!